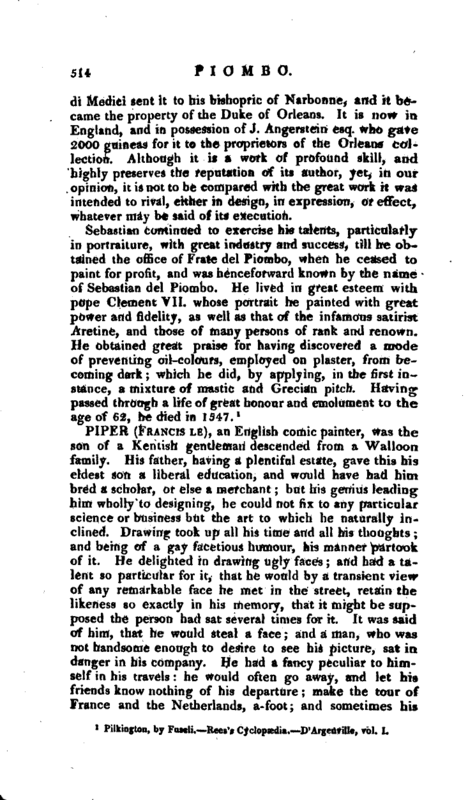 , an English comic painter, was the son of a Kentish gentleman descended from a Walloon family. His father, having a plentiful estate, gave this his eldest son a liberal education, and would have had him bred a scholar, or else a merchant; but his genius leading him wholly to designing, he could not fix to any particular science or business but the art to which he naturally inclined. 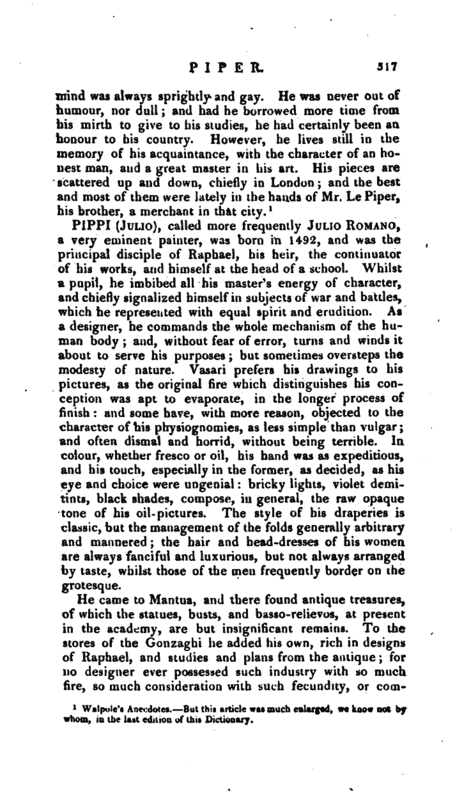 Drawing took up all his time and all his thoughts; and being of a gay facetious humour, his manner partook of it. He delighted in drawing ugly faces; and had a talent so particular for it, that he would by a transient view of any remarkable face he met in the street, retain the likeness so exactly in his memory, that it might be supposed the person had sat several times for it. It was said of him, that he would steal a face and a man, who was not handsome enough to desire to see his picture, sat in danger in his company. He had a fancy peculiar to himself in his travels: he would often go away, and let his friends know nothing of his departure; make the tour of France and the Netherlands, a-foot; and sometimes his | frolic carried him as far as Grand Cairo. He never advertised his friends of his return, any more than he did of his intended absence, delighting to baffle their conjectures, or tantalize their feelings. 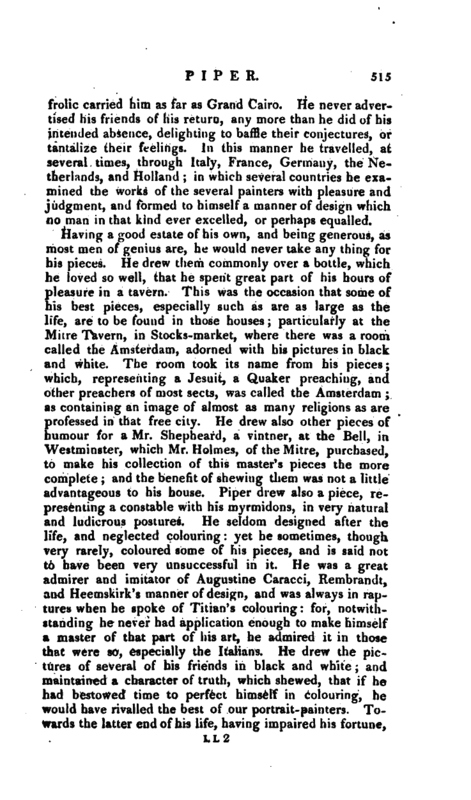 In this manner he travelled, at several times, through Italy, France, Germany, the Netherlands, and Holland; in which several countries he examined the works of the several painters with pleasure and judgment, and formed to himself a manner of design which no man in that kind ever excelled, or perhaps equalled. Being one day at a tavern with Faithorne, Hart the engraver, and others, he scratched a head with a coal on a trencher, arW gave it to Faithome, who touched upon it. In the mean time, Piper drew another on another trencher, and exchanged it with Faithhorne for that which he had touched. They did thus ten times; and, between them, wrought up the heads to such a height of force, that nothing could be better done in that kind. These trenchers are still extant; but we cannot learn in whose hands they are at present. His invention was fruitful, and his drawing bold and free. He understood landscape-painting, and performed it to perfection. He was particularly a great master in. perspective. In designing his landscapes, he had a manner peculiar to himself. He always carried a long book about with him, like a music-book, which, when he had a mind to draw, he opened; and, looking through it, made the lower corner of the middle of the book his point of sight: by which, when he had formed his view, he directed his perspective, and finished his picture. His hand was ready, his strokes bold; and, in his etching, short. He etched several things himself, generally on oval silver plates for his friends; who, being most of them as hearty lovers of the bottle as himself, put glasses over them, and made lids of them for their tobacco-boxes. He drew several of the grand seignors’ heads for sir Paul Rycaut’s “History of the Turks,” which were engraved by Mr. Elder. In the latter part of his life, he applied himself to modelling in wax in basso-relievo; in which manner he did abundance of things with good success. He often said, he wished he had thought of it sooner, for that sort of work suited better with his genius than any; and had he lived longer, he would have arrived to great perfection in it. Some time before his death another estate fell to him, by the decease of his mother; when, giving himself new liberty on this enlargement of his fortune, he fell into a fever by his free way of living; and, employing a surgeon to let him blood, the man unluckily pricked an artery, which accident proved mortal. Piper was very fat, which might contribute to this misfortune. He died in Aldermanbury, about 1740. 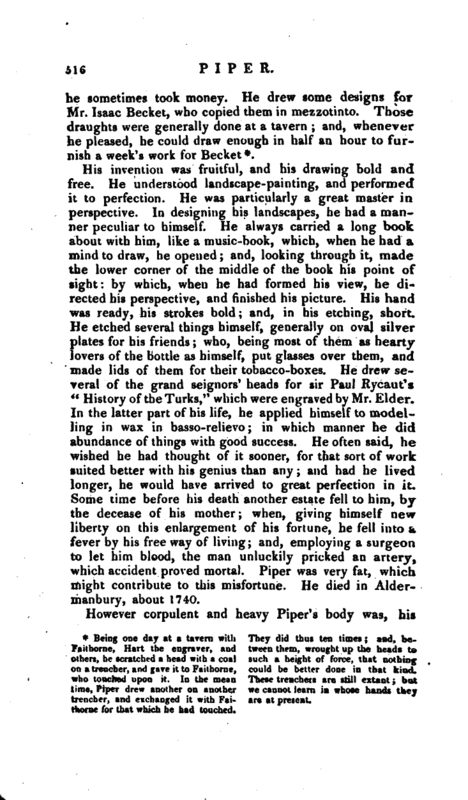 Walpole’s Anecdotes. But this article was much enlarged, we know not by whom, in the last edition of this Dictionary.